Top rated for safety, comfort and a best fit in the vehicle, the latest generation of the Pria 70 is here. The Pria 70 is known for advanced safety utilizing FlexTech for multi-directional crash energy management and air protect for advanced side impact protection. Top rated for safety, comfort and a best fit in the vehicle, the latest generation of the Pria 70 is here. The Pria 70 is known for advanced safety utilizing FlexTech for multi-directional crash energy management and air protect for advanced side impact protection. Now Maxi-Cosi introduces the Pria 70 fully equipped with new premium self-wicking fabrics that deodorize and draw liquids away from the skin, it keeps baby dry and comfortable to provide the ultimate comfort for your child during the journey. Keeping the Pria 70 clean is simple. Theres no need to remove the seat from the car or to make complicated maneuvers with the harness straps. The seat pad unsnaps and removes easily over the frame. The Pria 70 seat pad is both machine washable and dryer safe. All this allows you to get a thorough clean not available in other car seats. The Pria 70 is specially designed to fit better in your car, allowing more room for your passengers to stretch out in the front seats. 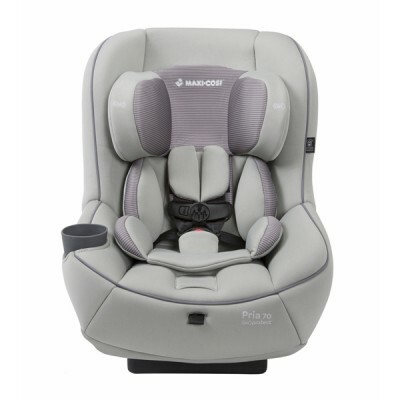 It fits children rear-facing starting at 9 pounds and keeps them cozy up to 40 pounds. When theyre ready to ride forward-facing, turn this car seat around to safely fit children up to 70 pounds. Both stages benefit from the safer side impact protection provided by air protect technology which protects your child where its needed most, around the head.